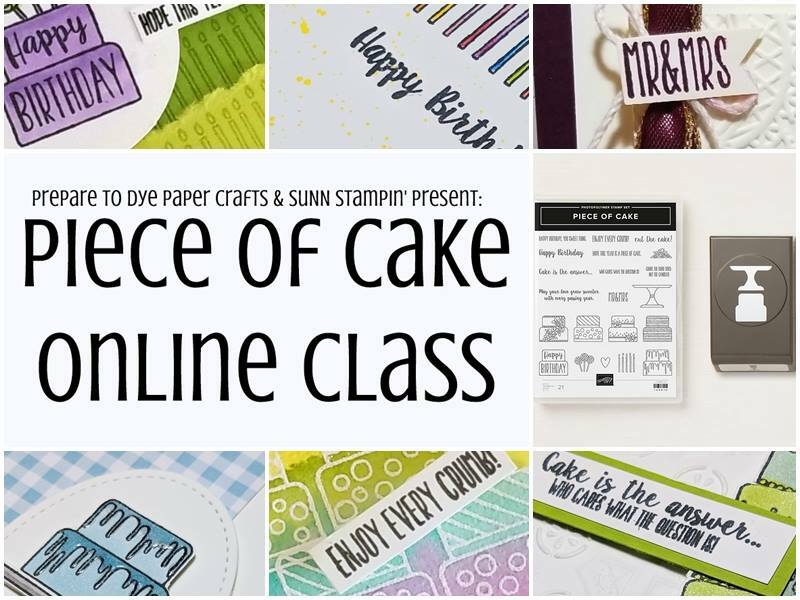 The Piece of Cake Online Class is here! You may register now, and class kits will start shipping Wednesday, March 27th. The class runs from now until April 30th. You must be in the United States to order from me. If you are in Canada, you can order here from Susanne Netz. FREE class consumables kit to make six cards, three designed by Susanne Netz of SuNN Stampin' and three designed by me. You will need your own ink, basic craft tools, and adhesives. Everything else is included. Six FREE exclusive video tutorials - the class password will be mailed to you with the class kit, and you will have lifetime access to the class. An invitation to join my VIP group! My VIPs have access to exclusive online workshops and giveaways, plus fun crafting memes, and who can resist those? Register using this form. Use a good email address that you check often, as this is where I will send your Paypal invoice for shipping on the class kit and any class updates and contact you if there are issues. Click here to buy the Piece of Cake bundle from my online store. Use Host Code JXHYUU96 at checkout. Note that the Piece of Cake Bundle is $31.50 pre-tax and -shipping. If you bump your order up to $50, you will be eligible for a level 1 Sale-A-Bration item if you place your order by March 31st. I will send you a Paypal invoice for $8 to cover shipping on your class kit. After you have paid the invoice and ordered the bundle with the host code, I will order your free gift and ship your consumables kit with the class password ASAP. NOTE: If you would like the class but already own the Piece of Cake bundle, you may replace the bundle with any combination of products of equal value ($31.50 before tax and shipping). Just register for the class, order from my online store, and don't forget to use the Host Code. You will still receive the FREE class kit, FREE gift, and FREE video tutorials. In this class, you are only paying for the Piece of Cake bundle, tax, and shipping. The consumables kit, Mini Dimensionals, and exclusive tutorial videos are my gifts to you.